The world has been captivated by the drama surrounding Bitcoin’s meteoric rise and subsequent collapse. In December, the price of a single coin reached nearly $20,000 before plummeting to below $6,000 in early February. Matters seemed decidedly grim when economist Nouriel Roubini slammed the “melting bitcoins” of the crashing cryptocurrency. Several days later, the general manager of the Bank for International Settlements joined in, likening the mania around Bitcoin to “a combination of a bubble, a Ponzi scheme and an environmental disaster”. Among these critical voices was that of Nobel Prize-winning economist Robert Shiller, who, even before the cryptocurrency lost nearly two-thirds of its peak value, expressed profound doubt over its longevity. But he was quick to separate his scepticism about Bitcoin’s long-term prospects from his optimism for the technology on which it was built: blockchain. Though the price of Bitcoin has been uncharacteristically stable at the time of writing (though it’s beginning to drop again), it’s difficult to imagine it reaching the zenith of late last year, particularly with mounting threats of greater regulation cooling down the speculative excitement. So, if Roubini and these other doomsayers prove to be correct and the preeminent cryptocurrency is teetering on the brink, what, if anything, will be its legacy? What will become of the blockchain? “Yes, the blockchain may seem like the very worst of speculative capitalism right now, and yes, it is demonically challenging to understand,” the author Steven Johnson writes in the New York Times. Indeed, it’s so poorly understood and yet seemingly vital for one’s survival in today’s digital age there are now blockchain courses on offer at a number of universities. The Royal Melbourne Institute of Technology will be launching the first of its kind in Australia this month. But whether you want to obtain a university-level understanding or simply just enough of the basics to get added to the office crypto chat, Johnson’s piece in the New York Times is a good place to start. In it, Johnson explains how by its very nature the blockchain has the potential to be truly disruptive – so disruptive that it’s frequently likened to the internet in the mid to late 90s – and on the verge of revolutionizing the way we live. The framework on which Bitcoin and other cryptocurrencies were built isn’t overseen by any one company or institution, rather it lives on a network of thousands of personal computers. A secure, distributed ledger, as it were. This is what is so significant about blockchain platforms: by creating a secure database across many different computers, this system removes the need for a bank or any other institution to exist at the centre overseeing and regulating the data. 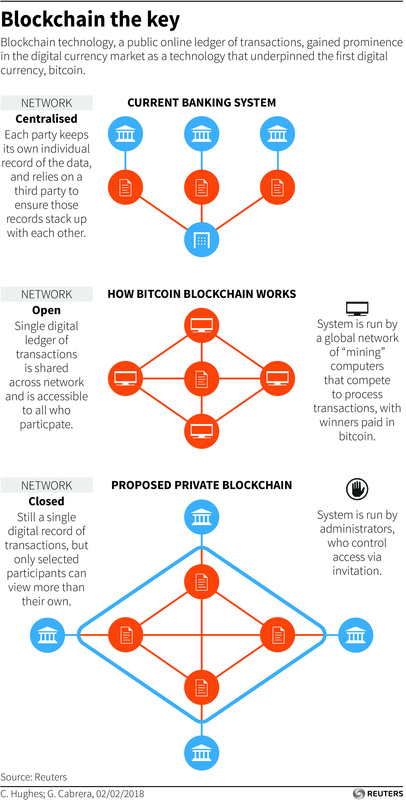 How does the blockchain work without some kind of intermediary facilitating the process? When it comes to Bitcoin, the first application of blockchain, a large network of computers validates and records all financial transactions in an open ledger that is secure from tampering. Those who help execute these transactions and maintain this ledger by offering computational power, receive Bitcoin in exchange for their services; much like a bank might take a commission for processing a payment. The government accountant analogy may have left you more confused. But still, you’ve gotten this far. If blockchain technology does indeed go on to account for as much as 10% of global GDP by 2027, as has been predicted, we may all feel it soon enough. It’s not really a question of if, but rather when. Because this technology is foundational in nature, it could be a while before we see its widespread adoption. But there’s already quite a lot of excitement around the idea of “smart contracts” – that is, any number of financial agreements that are set in motion automatically once the terms of a contract have been met. This could be virtually any kind of contract and executed without the help of a lawyer or accountant, which means greater speed and lower costs. Still, researchers have warned that smart contracts as they exist today have a wide variety of security vulnerabilities. With blockchain’s potential to radically transform, expedite, cheapen and secure the way we exchange money, conduct business, maintain medical records and even vote, we may indeed be living in the early days of the internet, left one day to wonder how we ever lived without it. “I think the blockchain is going to do really interesting things around the transfer of value,” writer and academic Rachel Botsman noted at Davos. Even though traditionally much of the chatter in the cryptocurrency communities has centred on disrupting the financial industry, Botsman doubts this technology will altogether result in currency exchanges bypassing the banks. “I don’t understand where that hype is coming from,” Botsman told the Forum’s annual meeting. Indeed, many banks, though hardly endorsing the exchange of cryptocurrencies, are certainly waking up to the possibilities of the blockchain, which could eventually allow them to automate many systems that currently require a large in-office staff. The fact that banks are investing in this technology may sound fairly paradoxical given the context in which it evolved and gained traction. People may have been more open to an alternative financial system, Botsman says, owing to the trust vacuum that developed in the wake of the global financial crisis. Behlendorf adds that people “don’t want to have to trust that entity at the centre”. The whole point of developing a cryptocurrency is to decentralize it, he observed. Behlendorf and Botsman both agree that decentralizing systems once headed by institutions could have significant social implications. For instance, what kind of social safety net is in place if things go pear-shaped? Say you lose your Bitcoins: who do you call? People have, in fact, lost millions worth of Bitcoins and no, there wasn’t a bank they could ring up to claim their losses.